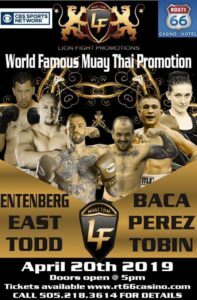 Legacy Fighting Alliance will be back in the Golden State in November, with the Women’s Flyweight title on the line in the main event. Sabina “Colombian Queen” Mazo (5-0) will make her first title defense against Brazil’s Carol “Japa” Yariwaki (7-2). 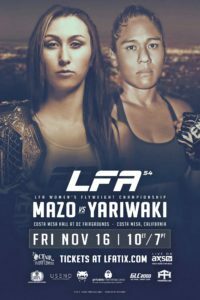 Mazo is a 21 year old phenom, who scored nearly identical head kick knock out wins in her first two LFA bouts, defeating Jamie Thorton & Linsey Williams. The King MMA trained, “Colombian Queen” won her crown in April with a unanimous decision over Shannon Sinn. Yariwaki the challenger is a 31 year old, BJJ black belt, with an 86% finishing rate. The Strong Team fighter, makes her US debut coming off a May TKO of Pamela Barros. LFA 54 takes place Friday, November 16th at Costa Mesa Hall at the OC Fair & Event Center in Costa Mesa, California.